Oh I do love a special edition box. When May's landed on my doorstep, I almost squealed at the pastel deliciousness of it. I'll definitely be keeping hold of this one! 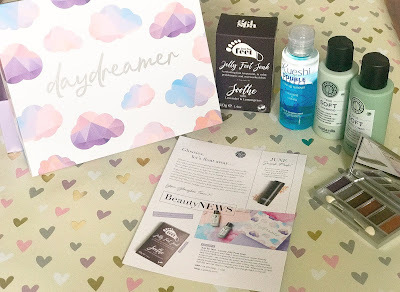 Inside the box though, was five equally dreamy products which were carefully put together to help us Glossies treat ourselves to a little pamper. First up is the Kueshi double-effect make up remover. This came in travel-size, so has been perfect for me recently as I've been backwards and forwards so much! It basically works like a micellar water, feels really light on the skin and works a treat at taking all my make up off. I've also received a luxury jelly foot soak from gelspa - and in all honesty I haven't tried it yet just because I've been so busy and haven't had time at all! It looks lovely though, and I'll definitely report back once I've given it a whirl! 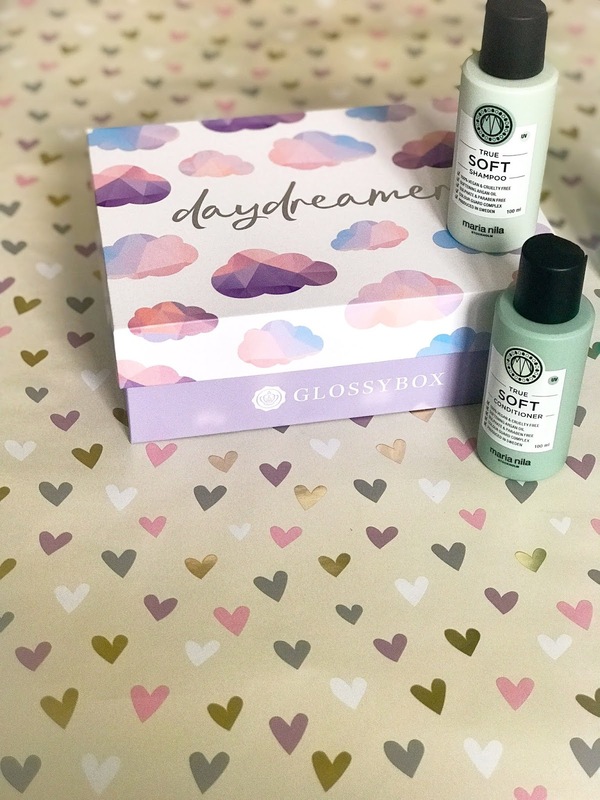 Having already tried Maria Nila products from previous Glossyboxes, I was really excited to unwrap the True Soft Shampoo & Conditioner. I have to be so picky with haircare, but I love these little duo. It does exactly what it says on the tin (or bottle), and left my hair ridiculously soft and didn't weigh it down at all. It smelled really nice and light too. I'll definitely be repurchasing this one! I think by far my favourite product this month is the super-cute TRIFLE Cosmetics Praline Palette. 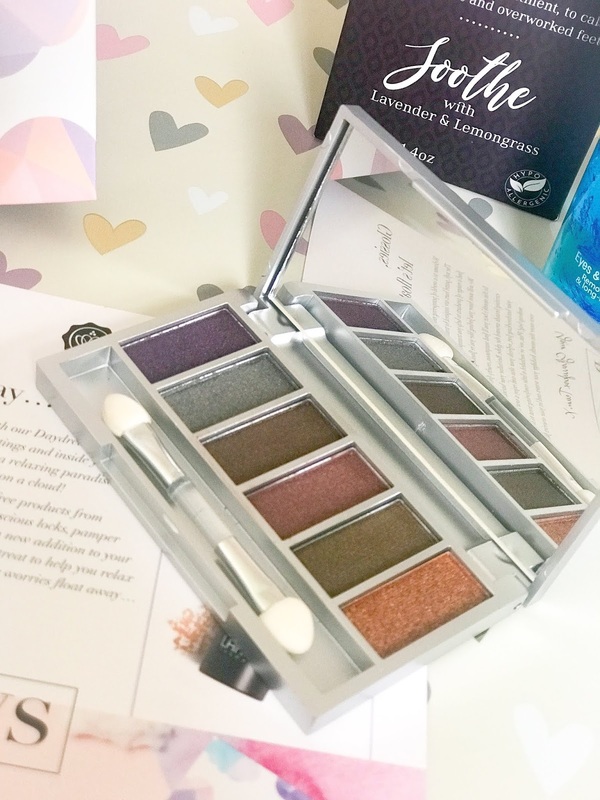 It contains six shimmery shades (and I LOVE shimmers), from khaki to deep purple to beautiful neutrals. They're all very workable, easy to blend and the colour is really easily buildable. I've been absolutely loving using it for day and night looks, and it's perfect to pop in your bag and take with you when you're out and about. Plus the design is adorable. I saw the shampoo and thought it was right up my street! Looks so good! & the palette looks so dreamy! I'd get this just for the box alone, it's so pretty! And I imagine would look lovely on a shelf after the products have been used! The box is so gorgeous! The products look amazing too, will definitely be checking them out.